Looking for Vendee gîtes, cottages and villas ? - Click here. 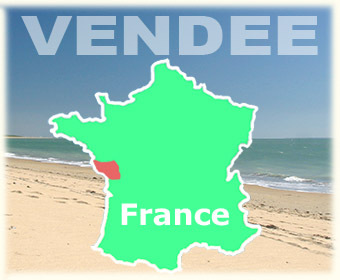 The Vendee - the easily accessible French holiday destination. The Vendee has the advantage of being a part of France that is very easy to get to, yet far enough south to enjoy a warmer climate, making it an ideal choice for families with children. This page offers suggestions for your travel*. For planning your trip to the Vendee and getting to your holiday cottage, you can use the Michelin or Mappy websites or rely on your GPS/Sat-Nav, but beware of errors and omissions. In all cases, we recommend that once your are in the general area you make use of the detailed arrival instructions that are provided with your holiday accommodation paperwork, as these are based on real local knowledge. See also - Hints and tips for holidays in the Vendee. If you are planning a sea crossing, the following chart of distances from the ferry ports will help you in deciding your holiday travel arrangements. The shortest sea crossings from the UK are Calais and Cherbourg, whereas the shortest drive in France is from St Malo (only 3 hours to central Vendee). See below for a full list of ferry crossing routes. Distances to the town of Lucon, by the usual road route. Individual holiday properties may vary from this depending on their exact location, which you can check on the map that is available with each property description. We have selected some suggestions here for good prices for your cross channel ferries to France. Compare prices to see which gives the best deal. 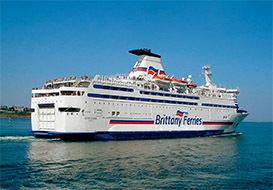 Properties on vendee-gites.com qualify for discounts on cross-channel ferries through the "Chez Nous" Travel Service. Click these links for a quote on-line. This link activates the discount scheme*. No discount code or booking reference is required. 5% discounts. *Note: If you have visited the ferry company website before, you may need to clear your browser temporary files ad cookies to get the discount to operate. You can easily fly to the Vendée, offering a competitive and convienient solution which is often ideal for low season breaks. Nantes Atlantique Airport to the north of the area. La Rochelle Airport to the south of the area. Depending on exactly where you are staying, these two airports are within 30 to 90 minutes drive drive of most of the Vendee. 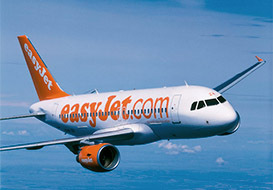 You can also fly to Poitiers Airport (90 minutes from central Vendee). Car hire is available at these airports (see below). You can consult the the usual low-cost companies for flights to these airports (links opposite) or see this Flight comparison site. Car hire is available for pick-up at the airports in this region, Nantes, La Rochelle and Poitiers. Try Rhino Car Hire for great deals on holiday car rental in France. Take care to specify the pick-up and drop-off times to correspond with your flights as some car hire companies can be a little inflexible in this respect at the smaller airports. Child seats can usually be provided, but make sure on this point. There is now a TGV (high-speed train) link from Paris to Vendee in under 3 hours, stopping at La Roche sur Yon and Les Sables d'Olonne. Combined with the Eurostar cross-channel service this offers a convenient alternative to ferry or plane. Car hire is available for pick-up at either station. See above for discount deals on ferry crossings for the Vendee. Last updated July 2015. There may be seasonal variations. Direct flights shown. Last updated July 2015. There may be seasonal variations. *Suppliers mentioned in this document are suggestions. The client makes his/her own free choice as to their suitability and we do not take part in any arrangements or purchases that the client may make through these companies. Book your holiday accommodation now.